This week, Environment Secretary Michael Gove unveiled plans to increase sentences for the most heinous cases of animal cruelty to five years in prison. The news made the front page of the Mail on Saturday and was picked up widely from there, including by Sky and BBC News. The move follows a number of recent shocking cases where courts have said they would have handed down longer sentences had they been available, and was widely welcomed by animal welfare groups, following dedicated campaigning from Battersea Dogs & Cats Home and the RSPCA. Currently, the maximum sentence is six months, but the government will bring forward new legislation that will increase that tenfold, sending a clear signal to any potential offenders that there is no place for animal cruelty in England. Emma Howard Boyd, Chair of the Environment Agency, officially opened Leeds’ latest flood defence scheme this week. The scheme will provide greater protection for more than 3,000 homes, 500 businesses and 300 acres of development land in Leeds with increased protection against flooding from the River Aire and Hol Beck. 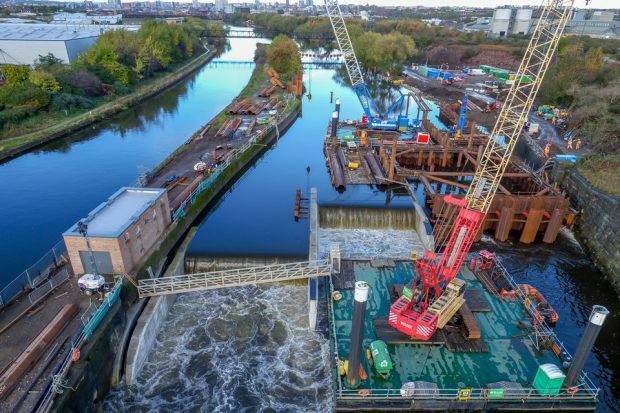 The government contributed £35 million towards the state-of-the-art £50 million flood defence scheme which uses moveable weir technology – a first for flood risk reduction in the UK. This ground-breaking scheme will not only benefit hundreds of homes and businesses in the city but it will also safeguard 22,000 jobs over the next 10 years due to the increased level of protection it provides. It’s been great to see Leeds City Council and the Environment Agency working together in partnership to better protect the city – and it is one of many schemes in the Defra programme investing £430 million to reduce flood risk across Yorkshire before 2021. We’re always looking for new ways that we can use technology to reduce flood risk so it’s exciting that this scheme is also a first for flood risk management in the UK thanks to the use of the moveable weirs which can be lowered when river levels are high. On a day-to-day basis, people won’t even know they are being protected, and they can enjoy the river which is a key aspect of the city’s South Bank regeneration plans. No one can forget the devastating flooding residents and businesses in Leeds faced nearly two years ago. We know how distressing flooding is for all those affected and I’m delighted that through this new state-of-the art £50 million scheme thousands more people living and working in Leeds will be better protected. Our commitment to strengthening flood defences across Yorkshire doesn’t stop here – we are investing £430 million over six years up until 2021 to better protect the region using the best technology and engineering available. The announcement has been widely covered reported by Yorkshire media including ITV Calendar, BBC Look North, Made in Leeds, Radio Leeds, Radio Aire, Capital Radio Yorkshire and the Yorkshire Post. It was also featured on BBC Radio 2’s Chris Evans Breakfast Show and in The Daily Telegraph. On Thursday, the Guardian published a story reporting comments from Fergus Ewing, Scotland’s rural economy and connectivity cabinet secretary, where he suggested Scotland could lose £700m in support, which is totally inaccurate. In fact, the UK government has been clear that total cash funding for farm support under both Pillar 1 and Pillar 2 of the CAP is protected until 2022 – a greater level of security than anywhere else in the EU, where funding is guaranteed only to 2020. As we leave the EU we will continue working with the devolved administrations, as well as farmers from across the UK, as we develop our new approach to agriculture. On Friday, Environment Secretary Michael Gove announced new proposals for a ban on ivory sales to help bring an end to elephant poaching. The proposals will put the UK at the forefront of global efforts to address the drastic decline in the elephant population and help combat poaching by removing opportunities for criminals to trade illegally-poached ivory. A 12-week consultation will run from today and cover items of all ages, not only those created after a certain date. In line with the approach taken by other countries, the government is proposing certain narrowly-defined and carefully-targeted exemptions for items which do not contribute to the poaching of elephants and where a ban would be unwarranted. NGOs including WWF, Tusk Trust and Stop Ivory provided strong support for the proposals. Stop Ivory and its partners welcome today's action by the UK government. By starting the process to bring in a total ban on ivory sales in the UK, the government continues to work with the African countries leading the Elephant Protection Initiative to secure a meaningful future for elephants across Africa – the initiative the government helped launch at the London Conference on Illegal Wildlife Trade in 2014. The unprecedented crisis we face – with Africa's natural heritage being destroyed and communities put at risk due to poaching by illegal armed gangs – will only stop when people stop buying ivory. Along with our partners, we congratulate the government on this important step and look forward to working with it and our colleagues to ensure the ban is implemented robustly and without delay. Most media outlets including BBC, Sky and ITV news all covered the story. Michael Gove also wrote exclusively for the Evening Standard on the proposals. The government has this week demonstrated its commitment to combating plastic waste in the environment. Environment Secretary Michael Gove launched a call for evidence on how reward and return schemes for drinks containers could work in England, while Minister Coffey travelled to Malta to take part in the Our Ocean conference – a global event bringing together heads of state, governments, industry and NGOs from around the world to discuss marine conservation and protection. More than eight million tonnes of plastic are discarded into the world’s oceans each year, putting marine wildlife under serious threat. We must protect our oceans and marine life from plastic waste if we are to be the first generation to leave our environment in a better state than we found it. That means tackling the rise in plastic bottles entering our waters by making it simpler and easier to recycle and dispose of them appropriately. Today we are launching a call for evidence to help us understand how reward and return schemes for plastic bottles and other drinks containers could work in England. This approach has already seen great success in other countries such as Denmark in curbing plastic pollution and we want to hear people’s ideas on how we could make it work in England. This adds to the progress we have already made in cleaning up our oceans by significantly reducing plastic bag use and drawing up one of the world’s toughest bans on plastic microbeads. The call for evidence opened on 2 October, will run for four weeks, and ministers have asked the Voluntary and Economic Incentives Working Group, set up as part of the Litter Strategy, to accelerate its work and report back early in the new year. Farmers Journal Scotland and Farmers’ Guardian reported comments from the Scottish Government suggesting the UK government purposely ‘omitted’ key Scottish protected food names, such as 'Scottish farmed salmon' or 'whisky', from deals including the EU-Canada Comprehensive Economic and Trade Agreement (CETA), and similar deals with Japan and Mexico. This is not the case. The UK government recognises the huge role protected food names play and we always promote Scottish products where possible. But ultimately it is the EU Commission, not the UK government, who negotiates with third party countries on which products are included in any new trade deal. The EU Commission largely chooses products based on current trade values and there are clear reasons why certain Scottish protected food names were not included in certain trade deals. For example, the reason no UK protected food names were included in the recent CETA deal is because, at the time of negotiation, only Scotch whisky was exported in large enough quantities and this already has separate protection in Canada. Likewise, the reason beef is not included in the EU proposals for protection in Japan is because beef from the UK currently cannot legally be exported to Japan. Protected food names play a huge role in boosting UK’s global food reputation and we always aim to promote Scottish products where possible to drive trade around the world. However, the EU Commission, not the UK government, is responsible for negotiating with third party countries on which products are included in any new trade deal.